Thanks to Shane Maberry who pointed out that I had incorrectly used locus, instead of focus. Oh, the shame! An ellipse is a squashed circle - it has been distorted so that its diameter in one direction is less than in the other. An ellipse can be drawn by using its focuses - the two blue dots in the diagram. 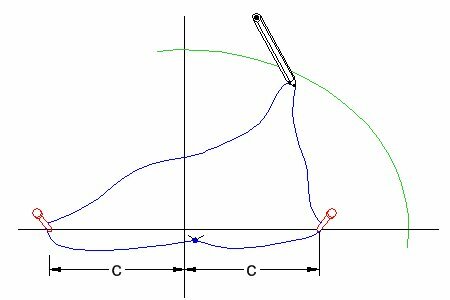 There are two methods for drawing an ellipse. Both involve using a couple of small nails and some string. Regular string is not ideal, as it is too 'stretchy' - try to get some stiff 'string' - heavier fishing line might be ideal, though I haven't tried it. Put a small nail at the position of each focus. Tie one end of a piece of string around one nail. Lead the string around the point of a pencil (or pen) and then back to the second nail. Tie the string to the second nail, adjusting the length of the string to get the pencil to start exactly on the end of the minor axis. Now sweep the pencil from the minor axis round to the major axis - in this example from the top clockwise round to the right. The only problem with this method is that you can only draw a quarter of the ellipse before the string from one nail gets wrapped around the other nail. This method is similar to method 1, except the string is not tied to either nail – instead it passes around both nails and the two ends are tied together. Again adjust the length of the string so the pencil falls on a correct start point. Now you can sweep the pencil right around the whole ellipse in one go, if you want. Now drop a second line, from the point where the circle met the first line, down to the major axis. This gives the position of one of the focuses and so also its distance 'c' from the middle of the major axis. Locate the second focus by going the same distance 'c' on the other side of the minor axis. That's all there is - you are now ready to draw the ellipse.